Did your New Year’s resolutions include saying good bye to old cans of paint? If they are latex paint, it is easy to dispose of them safely. Latex paint is not hazardous waste because it is a water-based product and does not contain oil or chemical solvents. When there is only a small amount of paint left in the can, the best option is to remove the lid, allow the paint to dry completely, and then dispose of the dried-out latex paint and can in your household trash. With cans that are one-third to two-thirds full of paint, add kitty litter, sawdust, or shredded paper and leave the lid off the can. Allow the paint to harden, then dispose of the can and lid in the trash. In both cases, be sure that the open paint can is not accessible to children or pets. 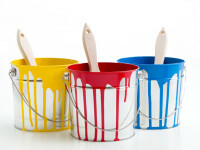 Remember—enamel paint, which is oil-based, and paint thinner are hazardous waste. Check with your local solid waste management authority for the proper way to dispose of hazardous waste in your community.